Over the years crowns have been constructed from many different materials, some good and some not so good. Porcelain crowns look fantastic but if they chip or crack, they are very difficult, if not impossible, to repair. Ceramic crowns work well for people with metal allergies while metal crowns are definitely the most durable but aren’t aesthetically pleasing. The newest material choice for crowns these days is Zirconia. Crowns and bridges constructed from this material are extremely strong and can withstand the daily wear and tear we put our teeth through. From the biting motion of the front teeth to the biting/grinding of the back teeth, Zirconia crowns can handle it all. The top priority when considering a crown is obviously your overall dental health. Generally crowns are recommended when dental restoration is required. For example, if a tooth is cracked or broken or if there is more filling that enamel in a tooth, then a crown is usually suggested. Next the aesthetics of a crown needs to be taken into consideration. Zirconia looks so close to real tooth enamel in color it’s often difficult to tell the difference. It can be shaded to matching the surrounding teeth and a Zirconia crown also has the ability to reflect light the same as a natural tooth. This is important if the crown is on one of your front teeth. Other positives of Zirconia crowns are they are corrosion free and there is no sensitivity to heat or cold typically felt with crowns made from other materials due to a lack of electrical conductivity. 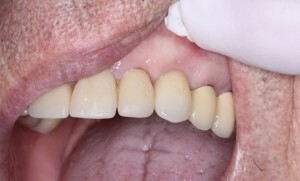 Plus the unattractive black often seen at the gum line when porcelain or metal is used doesn’t occur.